The best inflatable backpacking pillow currently on the market, the Cocoon Hyperlight Air-Core Pillow balances comfort, light weight and durability. It’s a fantastic camping and backpacking pillow because it’s designed with no bells and whistles. It’s simply a soft and comfortable product that effectively does its job. To put it to the test, we took the Cocoon Hyperlight on three separate camping adventures and used it just as man intended, for sleep. We measured it for comfort, durability, slipperiness and overall quality. If you’d like to read more about how the Cocoon Hyperlight compared to the other backpacking pillows we tested, check out our article on the best backpacking pillows. The nylon shell on the Cocoon Hyperlight is extra luxurious, soft and snuggly. You know that deep level of REM sleep where drooling is inevitable? I drool on this pillow a lot. The fabric does not crinkle at all and it’s fairly quick-drying in case of humidity or dampness. The Cocoon Hyperlight is intended to be a backpacking pillow, so you want it to be lightweight. At 2.4 oz, it’s in the mid-weight range when compared to other pillows of similar quality. Still, it packs down small and will fit in pretty much any nook or cranny in your pack. When you bring a backpacking pillow like the Cocoon Hyperlight on a hiking trip with a bunch of ultralighters, they will inevitably be jealous of your cozy evening set-up. People that don’t pack the Cocoon for the sake of sparing 2.4 oz will have regrets. The pillow is a simple rectangle just large enough to cradle your head. It’s not too big, small or heavy. Cocoon focused on making a product worth bringing to your bed at home, and they nailed it. Outdoor gear doesn’t have to be uncomfortable, and you’re reminded of that when sleeping with the Hyperlight. This isn’t too big of a deal since the pillow is small enough to fit snugly inside your sleeping bag hood. However, the fabric is slippery and I woke up once during testing without this pillow under my head. Unlike the Klymit Pillow X which is designed to hold your head in place, there is not much in the way of design to secure the Cocoon Hyperlight in one place all night. I do not like twist-style valves on inflatable products. It’s 2017 and I say that this finicky design needs an upgrade. I’ve owned the Cocoon Hyperlight for more than a year and while the pillow has held up, the threads of the twisty have definitely seen some wear and caused leakage over time. I’m rough on gear and that’s forced me to crank tighter and tighter on this valve to seal it as time goes by. Take the Cocoon Hyperlight camping and experience the best sleep of your life. Deflate it slightly and use it as a headrest on an airplane or car ride. Take it on a weekend backpacking trip and impress your friend with you extra luxurious — and lightweight — gear. At $30.95, the Cocoon Hyperlight is actually in the mid-price range for inflatable backpacking pillows (I’m still trying to wrap my head around how gear got this expensive). 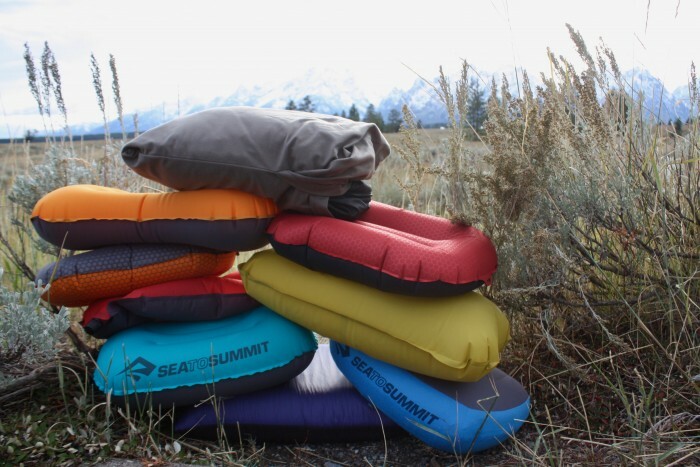 The Sea to Summit Aeros pillows, the only other options to match the Cocoon Hyperlight in comfort, cost a minimum of $9 more but performed worse in our testing. The Cocoon is a good, but not great, value. What better way to test a camp pillow than to take it camping?! We took the Cocoon Hyperlight on three separate camping adventures and used it just as man intended, for sleep. This was part of our testing to find the best backpacking pillow available. You can find our complete results here. Obviously, you want to know how the Cocoon Hyperlight fairs during backpacking. We set out to determine just that with a three day hiking trip through Grand Teton and Yellowstone National Park, carrying a number of similar inflatables with it. On a road trip through Texas, I used both the Cocoon Hyperlight (along with the Klymit X) as my pillow, back support and mid-drive nap support. This was where I really appreciated it as a neck support for car rides, because, let’s be real: the u-shape travel pillow is useless. We’re all willing to tolerate slight discomfort in the backcountry. At some level, we accept that imperfect sleep is a small price to pay when exploring the great outdoors. We especially tend to deny gear-caused discomfort when said gear cost a pretty penny, say $30 for a pillow. But bring that gear home to the luxury of a Tempurpedic bed and you’ve entered a discomfort zero-tolerance zone. I replaced all four of my perfectly luxurious home pillows with one Cocoon Hyperlight. Admittedly, it wasn’t half bad. There’s a reason it ranks so high in comfort. I’d use the Cocoon Hyperlight for camping and short backpacking trips more than I would thru-hiking. It’s extra comfortable, but a little heavier than similar products. At $30.95, the pillow is comparatively cheaper than other options and still extremely durable.